Believe it or not I have been thinking about all of you, every day! I found myself PARALYZED in the last couple of weeks. Two super rough EMDR sessions left me somewhat speechless, stunned, and in my lifelong default position…FROZEN. In the wild, when an animal is faced with a perceived mortal threat, and they can not, for whatever reason, fight OR flight, they freeze. (Think, playing possum.) After the perceived threat has passed, if the animal has survived, they have a “freeze discharge” where they expel the extra energy by shaking, trembling or some other rigorous physical activity. They then return to their normal grazing state. As if the threat never happened. Sigh. There is something beautiful about now understanding all of this and something unsettling at the same time. It means it’s time for growth, understanding and moving through the freeze. It’s as though I am learning in a molasses classroom. Each word I read, or allow myself to speak out loud, hangs there for a moment, suspended in time and space. Inertia. The little hummingbird in the picture (above) was in the street one night while I was out walking. This was long before I would ever acknowledge I had any trauma in my past. I saw the bird and stopped, crouching down on the street to say hello. He was just standing there. Not dead. 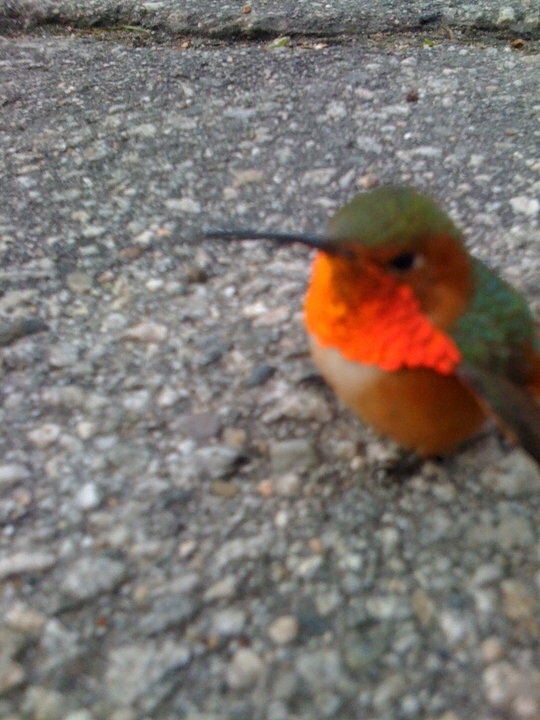 Though not “alive.” It was the first time I had ever been so close to a hummingbird. I wondered if he ran into something and was stunned. (Ohhhhh, Frozen.) His chest, each time he’d take a breath would GLOW in the brightest most electric red ever. Like he was his own private beaming Lite Brite that fell out of the game. I carefully picked him up, and moved him onto the grass. Then, afraid a dog would come along and eat him, I moved him again, off into the bushes. I still stood there, staring down at him. Or did I stand still there. Worried. Sad. Frozen. Amazed. He glowed red as I walked away. Later I went back to check if he was still in the grass. He was gone. I hoped he had flown away instead of being eaten. “God will take care of the bird.” The thought came to me like a voice from above. This is part of nature. God has a plan, and will take care of the bird. I think about that little hummingbird all the time. God will take care of you. How his heart and chest still glowed even though he was essentially frozen in time. Unable to move. Temporarily paralyzed. Dead for a minute. I’ve been temporarily paralyzed but my heart still glows. It feels like some kind angel has come along and swept me up in her brilliant Lite Brite arms, telling me it will be okay, that God will take care of this little bird, too. She set me aside in a safe place until I regain my senses. I think I just woke up and found that I am safely grounded in the grass. ~ by Kissing The Cockroach™ on April 18, 2012. Oh, man, do I understand the FREEZE response. This is a really clear explanation and helped me as well. It’s totally understandable why you couldn’t write and/or publish for a while. Martha Beck, in “Finding Your Way in a Wild New World”, wrote about a guy who is making a living working with trauma survivors (usually war or natural disaster) by teaching them how to tremble and shake to release the body memories. I’m blanking on the guy’s name, but it’s very interesting work. Omg yay! You get it. I am only on page 44 of this new book and can only read a couple pages at a time. I’m learning, for myself, and then hopefully some day, to help others as well. There is an AWESOME book called “Overcoming Trauma Through Yoga” by David Emerson and Elizabeth Hopper. I am taking a training next month for Yoga Warriors. It’s a trauma sensitive program that teaches you how to help veterans with PTSD through yoga. The body has huge healing powers if we let ourselves speak through it. Thank you!